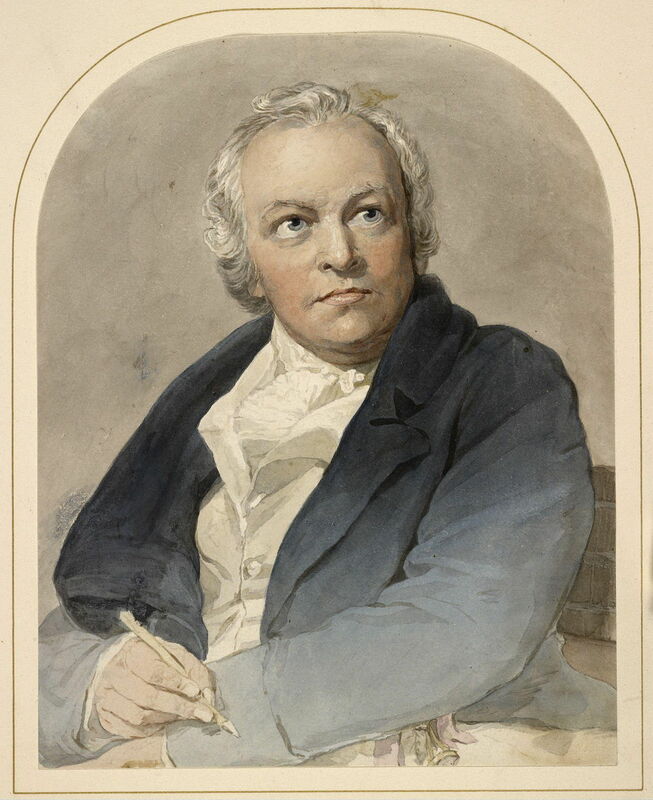 Given his popularity and influence, William Blake (1757–1827) is not an ‘easy’ artist. I have been intending to write this article, introducing my new series examining his paintings, for several months. But each time that I thought that it was ready to go, I realised how little I still knew about him and his art. Portrait of William Blake, Watercolour on paper Thomas Phillips (1770–1845) copy after, Portrait of William Blake, copy of oil original (1807), watercolour on paper, dimensions not known, The Morgan Library, New York, NY. Wikimedia Commons. Today, his writings – particularly his illustrated books – are probably his most popular works. Although the literature examining his life and work is vast, relatively little has been written about his paintings, and what is available is hardly consistent. Anthony Blunt (the Poussin scholar, former director of the Courtauld Institute, and self-confessed Soviet spy) wrote that “Blake had little natural facility as a painter” and “not only many of his early works but also some of his later works are clumsy”. Yet others praise Blake’s technical and artistic accomplishments. William Blake (1757–1827), The Death of the Wife of the Biblical Prophet Ezekiel (c 1785), pen and black ink and wash over graphite on cream wove paper, 34.6 × 47.9 cm, Philadelphia Museum of Art (Gift of Mrs. William Thomas Tonner, 1964), Pennsylvania, PA. Courtesy of the Philadelphia Museum of Art. In truth, many of Blake’s paintings have great beauty, reflecting his skill as a painter and artist. The Death of the Wife of the Biblical Prophet Ezekiel (c 1785) is a fine example, executed in just ink and wash over graphite. The prophet Ezekiel had preached that you should neither weep nor mourn for your dead, and here has to follow that direction when his own wife died, while others express their grief quite openly. However, Blake expresses this simple narrative in a very modern way. His refusal to follow artistic conventions of the day and persistent experimentation throughout his career made it hard for his contemporaries to appreciate his work. William Blake (1757–1827), Malevolence (A Husband Parting from His Wife and Child; Two Assassins Lurking in Ambush) (1799), pen and ink and watercolor over graphite on paper, 30.2 × 22.5 cm, Philadelphia Museum of Art, Philadelphia, PA. Wikimedia Commons. A Father, taking leave of his Wife & Child, Is watch’d by Two Fiends incarnate, with intention that when his back is turned they will murder the mother & her infant. If this is not Malevolence with a vengeance, I have never seen it on Earth. Although Blake reassured Trusler that he “had been compell’d by my Genius or Angel to follow where he led”, it was eventually rejected by Trusler, leaving Blake to accuse him of having “fall’n out with the Spiritual World”. 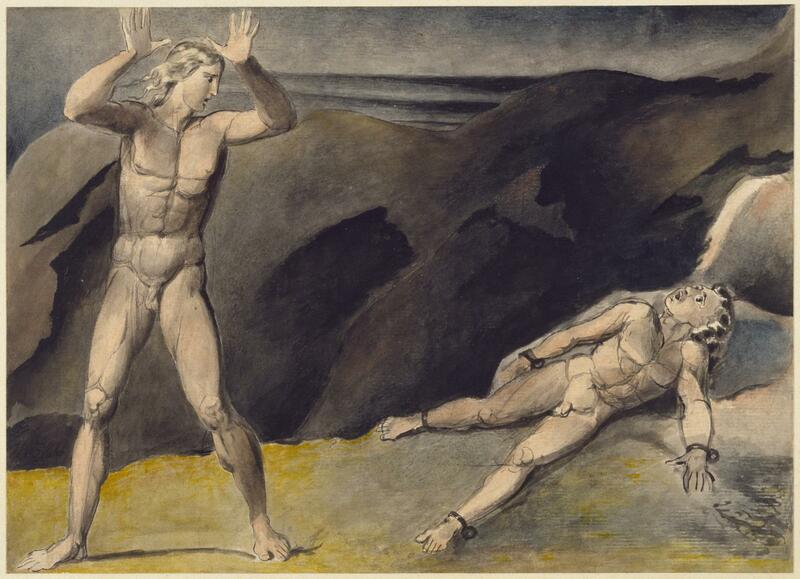 The Spiritual World was central to Blake, to his life, writings, and paintings. His religious and spiritual concepts are largely peculiar to him, and those of his works which refer to Biblical narratives often view them unconventionally. Blake was nothing if not original and idiosyncratic. His most popular works – his illustrated books – integrate paintings, illustration, decoration, and his own writings into single packages, from which it is arguable as to whether it makes sense to isolate their paintings. Less well-known are the many paintings which he made for his patrons, or which he exhibited apart from his writing. From the outset, Blake refused to paint in oils, a decision which condemned his paintings to obscurity during his lifetime. Like the Pre-Raphaelite Brotherhood (PRB), he held strong views about earlier painters, although Blake praised the work of Raphael rather than condemning it as a corrupting influence, as did the PRB. 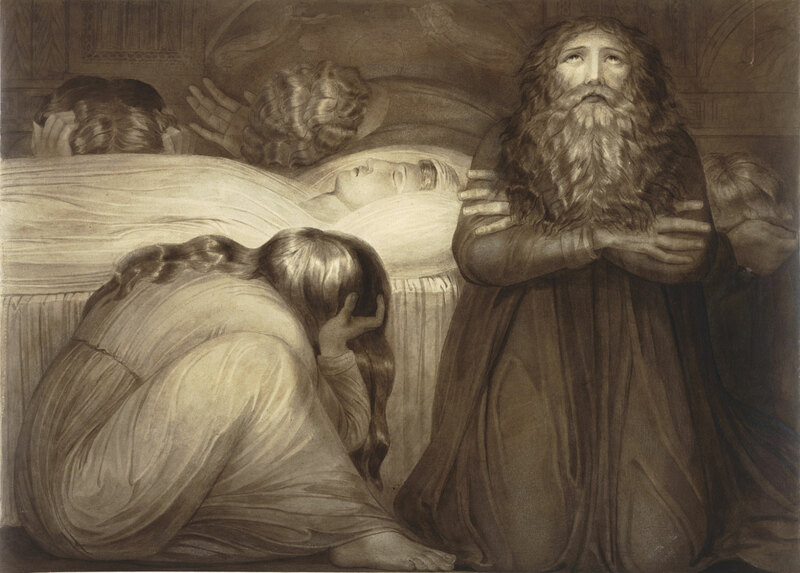 He was held in high esteem by Pre-Raphaelites, and Dante Gabriel Rossetti even purchased one of Blake’s notebooks a year before the PRB came into being. Blake was convinced that one of the secrets of success of older paintings was their use of the fresco medium, although as he never left the south-east of England his experience of Italian fresco painting was extremely limited. Blake re-invented a method of glue tempera painting which he referred to as “fresco”, but which has sadly resulted in many of his most important paintings ageing very badly. This makes it very hard for us to envisage what they must have looked like when first painted. 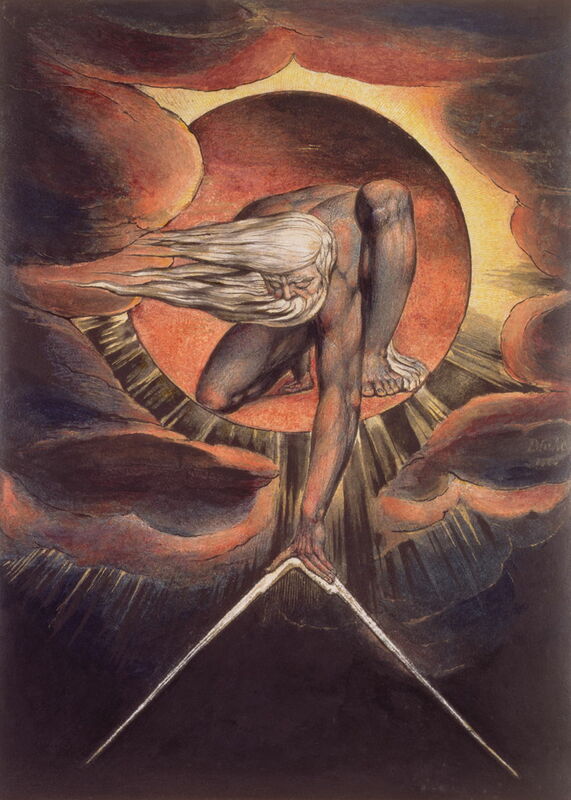 Above all, many if not most of Blake’s paintings refer to his unique and highly personal mythology, and to the visions which he experienced throughout life. It can be impossible to understand the references in his paintings which are grounded in this mythology. It is easy to be misled by modern presentations of Blake’s paintings. The painted etching now known as The Ancient of Days (c 1821), for example, is commonly associated with the Christian God. It would be easy to see him here as the master craftsman, forming the world out of the darkness below heaven, in an innovative but hardly revolutionary interpretation of the opening of the book of Genesis. That was not Blake’s intention: rather, this painting represents Urizen, one of the many figures from his own mythology, which is documented only in Blake’s writings. There, Urizen symbolises reason, his name most probably a semi-conscious pun on your reason. This painting shows Urizen the architect, creating the world using his compasses. He goes on to have the role of the jealous and vengeful god of the Old Testament, but his desire for dominion brings about his downfall into a state of Satan. Los and Orc (c 1792–3) is another watercolour which is impossible to read without understanding who its protagonists are. Los (at the left) represents poetry, the worldly expression of the creative imagination, and the prophet of eternity, who reveals the basic truths. Orc, seen here bound to a rock at the right, is revolution in the material world. The oldest son of Los and Enitharmon (see below), he hates his father Los in an Oedipus complex of love for his mother. Los is driven to bind Orc to this rock on the top of Mount Atlas, using the chain of jealousy. Orc’s limbs then become enrooted in the rock, pinning him there. This cannot prevent Orc’s imagination from raging, though, and permeating everything. 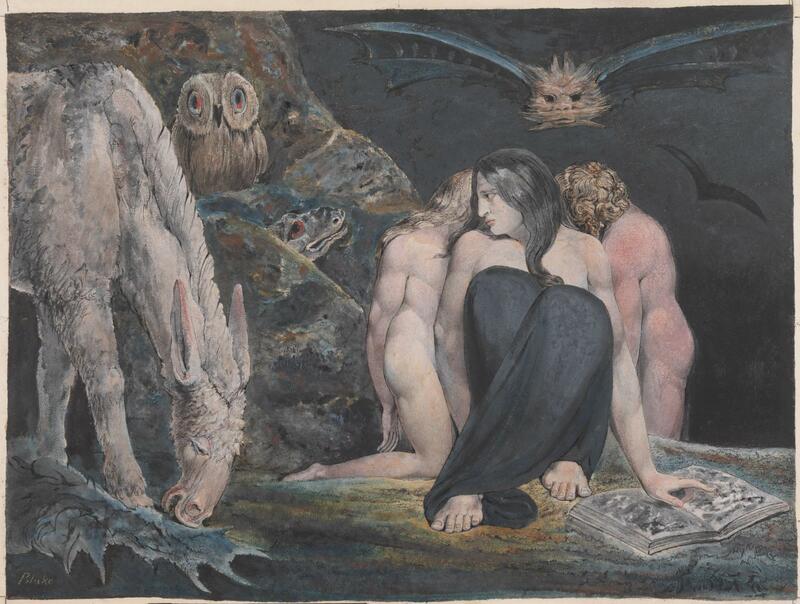 The Night of Enitharmon’s Joy, formerly and misleadingly called Hecate, (c 1795) is another of Blake’s prints painted over with watercolour, whose strange beauty conflicts with Blunt’s claimed clumsiness. 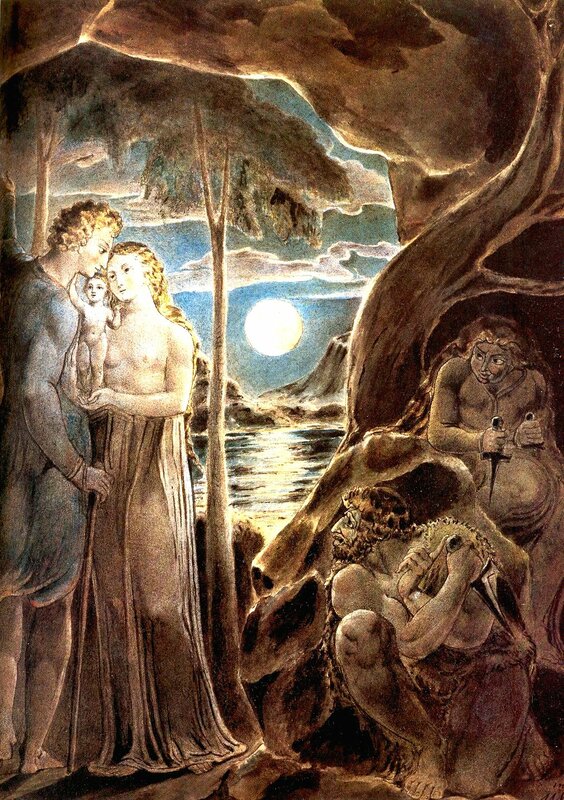 Enitharmon, partner, twin, and inspiration to Los (and mother of Orc), is spiritual beauty, and was modelled on Blake’s wife, Catherine (who may have been the model for her figure here too). In her ‘night of joy’, she establishes her Woman’s World, with a false religion of chastity and vengeance – which is Blake’s view of the 1800 year history of the ‘official’ Christian church. As the moon to the sun of Los, she is accompanied by symbols of night, such as the owl and bat. She also plays the role of Eve, which may explain the head of a snake peering out towards Enitharmon here. Read as a painting of Hecate, the Ancient Greek goddess of magic and sorcery, it could conceivably show her popular triplicate form, with the symbols of the night, and the serpent, one of Hecate’s attributes. But this is anomalous, in that all three figures in the triplicate version of Hecate invariably face out. My next article will look in more detail at the references and influences in The Ancient of Days. I will then trace Blake’s life and career, explaining how his intention to become a history painter was thwarted, and how his rejection of the teaching of Sir Joshua Reynolds (just like that of the PRB) shaped his art. Blake, W (2000) William Blake: the Complete Illuminated Books, Thames & Hudson. ISBN 978 0 500 28245 8. Blake, W, Erdman, DV & Bloom H (1988) The Complete Poetry & Prose of William Blake, Newly Revised edn, Anchor Books. ISBN 978 0 385 15213 6. Frye, Northrop (1947, 1969) Fearful Symmetry, a Study of William Blake, PrincetonUP. ISBN 978 0 6910 1291 9. Posted in General, Painting and tagged Blake, Blunt, painting, PRB, Pre-Raphaelite, Rossetti. Bookmark the permalink.